On a cloudy or rainy day the glacier looks blue. 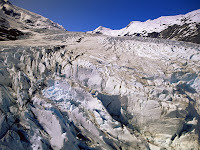 Calving is the process of the glacier breaking off into the lake. 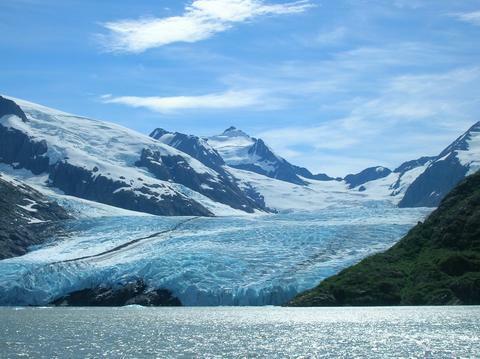 Located 50 miles south of Anchorage at the tip of Turnagain Arm, Portage Valley was carved by numerous glaciers that still straddle mountain peaks visible from the valley floor. At the end of the valley, icebergs that recently calved off Portage Glacier are visible. A century ago, Portage Glacier terminated on land at the western end of Portage Lake, filling the lake with ice. The glacier has been in steady retreat since then, partially due to global warming first associated with the end of the Little Ice Age around the mid-19th century. The best way to view it is either by boat or by foot. By boat, you can take the tour boat "Ptarmigan" around the lake to get a close-up view. By foot, you can hike up the Portage Pass Trail (from Whittier side) to get an aerial view of the Glacier. The Portage Pass Trail is the old roadbed before the tunnel was built. To get to the Begich, Boggs Visitor Center, take the Seward Highway to Portage Valley Road. Take a right, then follow the road to the right and there will be a turn-off to the Portage Glacier Lodge on the left. Keep following the road as it loops around. The first road off to the right after you pass the lodge is the road to boat dock. Lakefront parking is just up ahead and if you continue towards the visitor center, where parking is available. It's totally upto the point. Very interesting and upto the point. Portage glaciers seems to be one of the best destinations.